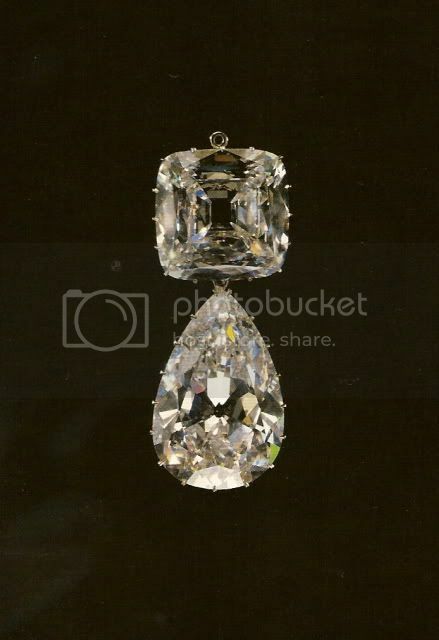 By the by, Dona's fondness for jewels apparently did not result in a collection from her husband that compares to that of Alexandra or Mary, true? What ever became of the jewels Dona did have? 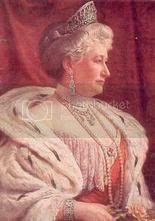 I'm not an expert on the jewellery collection of the Hohenzollern family, but you may be correct in saying that Dona's jewels were not in the same league as Alix of Wales or her daughter-in-law May. May, it must be said, pulled out all the stops when it came to acquiring jewels, and her collection way outstripped in value and importance the collections of the previous two queens of England. 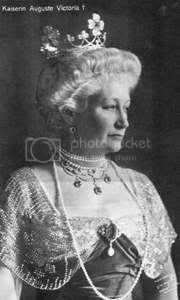 Anybody have any info about Hohenzollern jewels, or are there any books that deal with them? 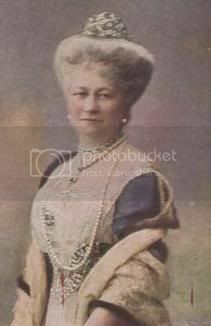 The one I'm most familiar with is the tiara that Victoria Louise was seen in and which she had most of her life and then it passed to Queen Frederika of Greece and I'm not sure where it went from there--I think to her daughter Queen Sophia of Spain. 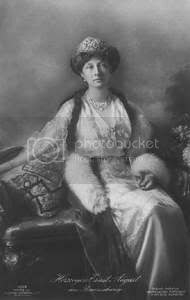 Empress Augusta had just a few tiaras, I think, based on photos. She was pretty religious and pious so perhaps she thought it was wasteful? You don't read much about her entertaining at parties ala Miechen or MF so she'd really just need some jewellery for State visits and the like. Thanks GDElla. That tracks with the fact that the Hohenzollerns did not have a "crowning" at their coronation when the empire was founded. Both Wilhelm I and son Frederick felt the crowns and jewels were not in the spirit of the revitalization of the Holy Roman Empire. Theirs was an intended more"peoples" monarchy and hence, the drive to amassive a big stach of jewels did not get much attention. WI himself even slept on an army cot in some sort of act of humility. So, all that being the tone of the German imperial family, the collection of jewels must limited. This is a diamond tiara which consists of 4 large & 8 small trefoils The base is a wreath of acorns and oak leaves, centering on a crowned and winged crest of the Imperial Family. Interestingly, Kaiser Wilhelm II designed this tiara himself as a present for their 25th Wedding Anniversary. It eventually passed to Kira who was seen in it a few times. It was apparently later sold and broken up into 2 separate tiaras. 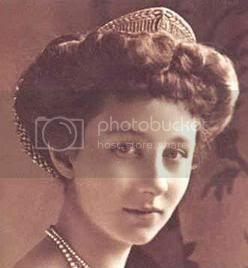 This seems to be one of Dona's favorite tiaras and it features in some of her better known photos and portraits. One of the most familiar (and maybe pricey, I'm not sure) tiaras is the Meander tiara which belonged to Crown Princess Cecile. A popular style around the turn of the century, the Meander was a particularly attractive diamond & platinum (unusual choice) tiara. There are 2 rows of meanders which are separated by a rather intricate trelliswork. In the middle of each of the trellis is a large brilliant diamond. It was designed by the Imperial jeweller Koch. 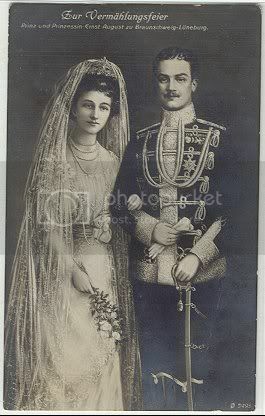 Crown Prince Wilhelm presented it to his bride on the occasion of their wedding in 1905. 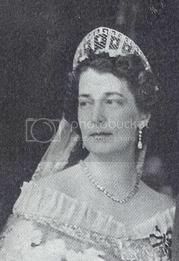 The tiara was worn by Grand Duchess Kyra of Russia at her marriage to Cecile's second son (and heir to the Prussian throne after his brother's morganatic marriage) in 1938. This grand affair demonstrates the importance of this tiara within the family. It was also worn by Kyra & Louis Ferdinand's daughters at their weddings: Marie-Cecilie in 1965 and Xenia in 1973. Given its value--both monetarily and sentimentally it is probably still owned by the family. 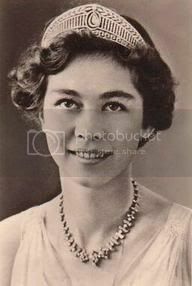 Another of Dona's tiaras was this one which was shaped like a series of interlocking 'flowers'. Every jewel is a diamond. By royal standards, this is a relatively small one, consisting of a diamond base with 7 diamond 'flowers' and each is topped with a diamond. 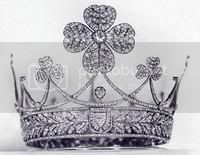 This tiara is also seen in one of the more well-known photos of Dona. 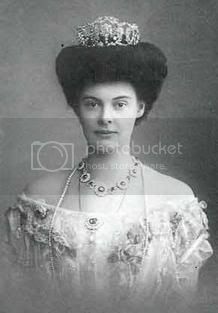 I haven't found any photos of Victoria Louise or any of the daughters-in-law wearing it so I don't know if it was inherited or sold. 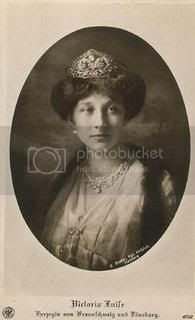 Dona & Wilhelm's daughter Victoria Louise also possessed a very lovely diamond tiara which she wore when she married Ernst August, Duke of Brunswick in 1913. It must've been a particular favorite as VL is seen wearing it even as an elderly woman. 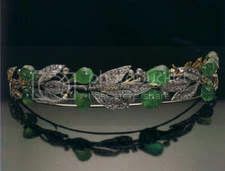 I'm not sure if this is the tiara which Frederika wore at her wedding to King Paul of Greece. Amazing tiaras GDElla. You have done us proud as usual. I am not overly fond of that trefoil tiara of Dona's - the design is rather ghastly and top heavy. 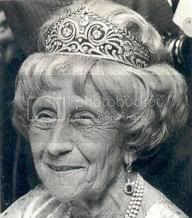 I do like Victoria Louise's tiara though and the photo of her as an old lady is quite remarkable - reminds me of those Beaton photos of Marie Louise late in her life. An emerald tiara (which looks very tiny perched on Dona's large hairdo!). This tiara dates from the early 1800s--it may be of Russian origin and then brought into the Prussian royal house through inheritance. It is designed as a graduated bandeau of triple laurel leaves. There are 13 larger round diamonds which compose the 'buds', with 5 pairs of pear-shaped cabochon emeralds topped by diamonds. They are mounted in silver and gold. 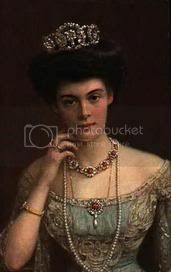 This tiara was inherited by Victoria Louise. 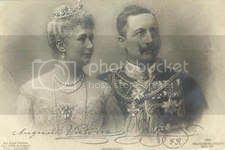 It had been received by Dona in 1906 as another tiara from Wilhelm to commemorate their silver annivesary. 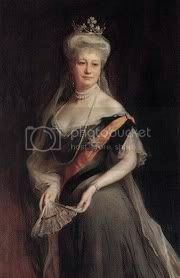 It went from Victoria Louise to her daughter-in-law Sophie of Hanover. It was sold in 1974. The leaf and berry motif is very popular for tiaras. 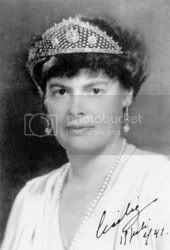 That emerald and diamond tiara is very remeiniscenyt of Olga K's ruby and diamond berry and leaf tiara........Didn't Margherita of Italy have something similar as well? Yes, GDElla you are the oracle! And I agree with Martyn...the design by WII is fairly ghastly ! But, I am sure Dona was gracious in accepting her husband's attempt at creastivity. While the jewels do not measure up to the Romanov or Windsor's collections, I am more impressed than otherwise would have expected. Isn't Cecelie in her ruby tiara the picture of a fairy tale princess? She really had the perfect look.